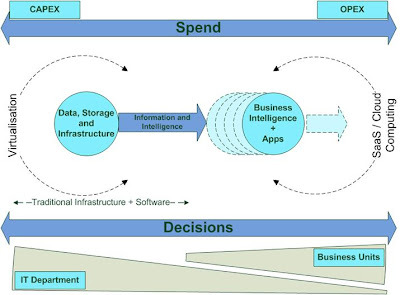 I have been talking over the past few days about decision making for a SaaS product and the impact technologies such as Virtualisation are having upon organisations IT budgets. 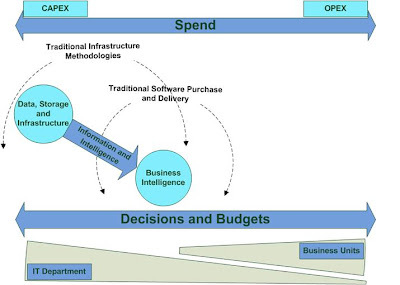 Obviously different companies look at this differently but from my experience, to some extent, IT departments will have a) some (if not all) control over budgets assigned to systems and technology and will also become heavily involved with any decision being made around new systems and products being purchased for the business. It is also key at this point to consider where the money is actually coming from, Operational Expenditure ,or more traditionally Capital Expenditure. Due to the nature of traditional IT projects, Hardware, Licencing and Project Costs will be heavy upfront with the supplier only charging a low percentage of the overall costs on an ongoing basis. Taking into account companies underlying infrastructure, this can be summarised int he diagram below. In a SaaS scenario, pricing and costs are worked in a totally different way. The service provider invests in infrastructure and generally delivers the application or suite of applications on an ongoing cost model, much as a mobile phone or land line service would work. In fact, if you remove the contracts in the mobile scenario (which are actually only put in place due to the upfront hardware you are given) this is exactly the same with the ability to turn the service on or on a monthly basis.With products such as this, and the delivery of the product "Over the Cloud" there is very little need for upfront expenditure. What this means is that companies can look at the costs for this service as an operating cost and as such, the decision making process also moves away from the IT department and into the separate business units as it is their operating budget being directly affected. This new Scenario can be visualised in the diagram below. What this means is that whether you are a service provider looking at delivering SaaS/Cloud products or a company looking at potentially subscribing to one of these systems, decide where the decisions are going to be made and where the money is coming from as this may be different to what you are used to.